If I could be 100% sure I'd look as cute as her w/o hair, I would shave my head in a heartbeat! 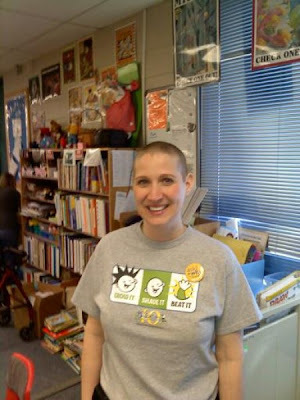 Kate, you look amazing and what you're doing for Logan and other kids with cancer is truly an inspiration! Love people who walk the walk! Thanks for sharing. I just found your blog and wanted to let you know I am reading. I don't remember exactly how I found it but it was in part through JG. Oh, and I am in Japan. Not the mainland but Okinawa! What a great cause! That's awesome! It is in the eyes of the other person that is observing the beauty in the other person that is having. I am always here to motivate you for fighting this cancer and hope for your cure.